One of the most curious concepts I encounter on a weekly basis is the concept of a ‘QuietZone’. For those who’ve not had the fortune to travel on one of the many (privitised) train operators in the UK the idea might seem obvious at first glance – a train full of people can be a noisy place – so why not designate one carriage, a kind of library like carriage, where the social contract is to keep noise to a minimum. Unfortunately, this being Britain, things are not so simple. Eat noisy food (such as crisps, crunchy biscuits, etc). Do anything with a phone that involves noise – receiving an SMS, typing, etc. Now I’m not making any judgement or outcry about this – I’m just reveling in the curiousness of the situation. Mobile phones users started out as a cultural outcast – loud, rude, inconsiderate (cf. the TriggerHappyTV sketch below) – and this got encoded in the expected behaviour of the QuietZone (whether intentionally or unintentionally), and has since got overtaken by what is now the cultural norm – that everyone has a mobile phone, and feels at liberty to use it without thought. 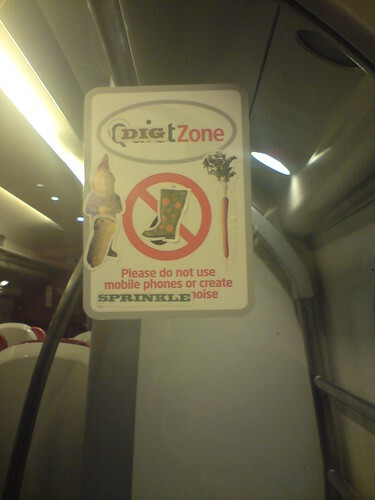 So you end up with the QuietZone, and the the myriad bizarre juxtapositions, like someone stopping mid (silent) Blackberry email to lean over to someone else talking (quietly) on the phone to remind them it’s the QuietZone, and using phones isn’t allowed.